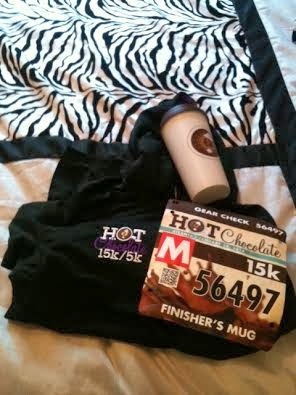 This was my second year running the Hot Chocolate run. I ran the 5k last year and this year signed up for the 15K. A week or two before the race I somehow hurt my ankle and it hurt very badly to run on...So I had to sell my ticket :(. 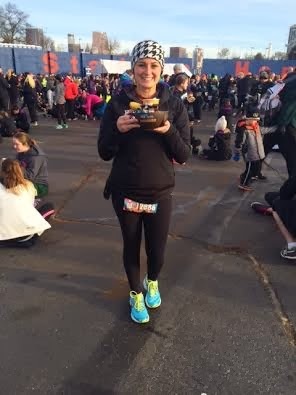 I sold my 15k ticket and bought a 5k ticket because the thought of not running this race made me very sad. So I went against what everyone said to me and did the 5k! I do not regret it one little bit! 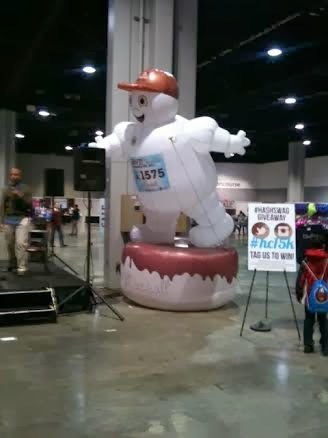 The Hot Chocolate race had two days of the expo Friday and Saturday.. And NO packet pick up on race day. Which is fine by me because I personally like going to the expos to pick up my race number. I went to the expo Friday night and for an overall score of the expo I give it a 6. It was just mehh. The line was fast and was very organized! Nothing wrong with it just kind of boring! To pick up your swag bag and bib was very simple! Weren't very many vendors more than last year but that's not saying much. They had a DJ which was a plus. Picking up packets was a plus. the vendors were organized so that's another plus. I get there and the parking is at the Georgia World Congress Center (which parking is $10). I'm not crazy about that location when you can't even get enough vendors to fill the room! 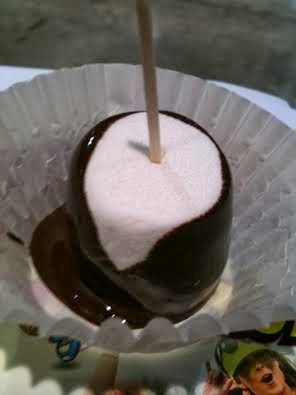 The expo had a chocolate station where you can get hot chocolate and chocolate covered marshmallows! On to race day.. 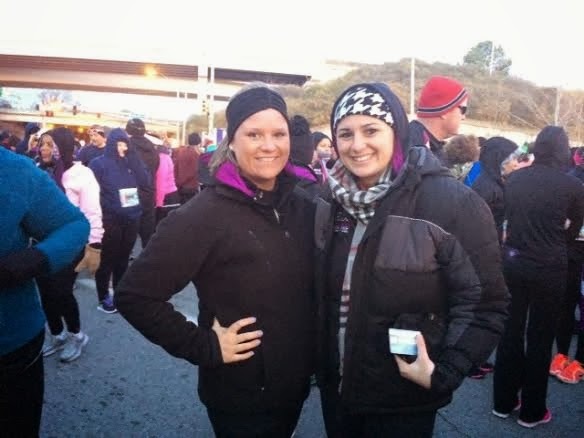 I did the 5k with a friend who is just now starting to run, yay for having a new running friend! 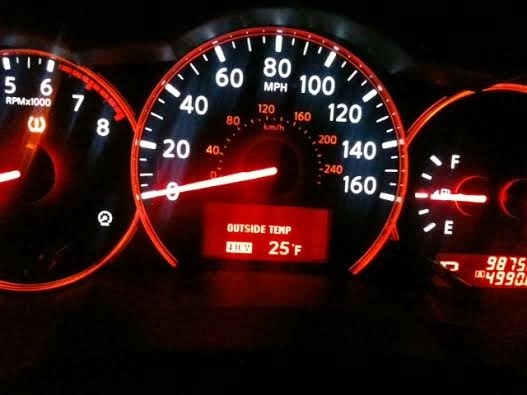 The temps have been very low in Atlanta lately (low for the south that is). I went to the thrift store and bought a big puffy jacket that I could throw out when the race started. You could either buy a parking pass for $10 and park at Turner Field or you could park at Centennial Olympic Park and take the free shuttle (that is part of the $50 you paid at registration). I have learned in the past two years the shuttle is the way to go! People that bought the parking pass had a hard time getting into the city or were late to the race. Do (which is my friend) and I rode down together were parked by 6:45 and hopped on the shuttle (i'm not kidding literally there was no wait for the shuttle). We get to Turner field around 7:00 maybe 7:10 jump off the shuttle and head over to the starting line. 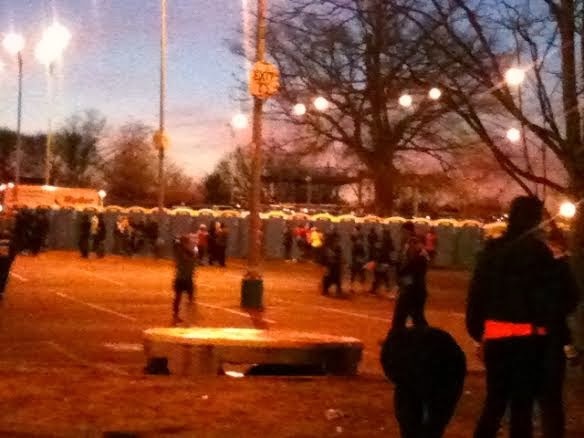 We had a few extra minutes until the race began so we go on a potty break. And I tell ya what I was very impressed by the bathrooms, LOTS of portojohns! Any runners dream (and I wish I was kidding). We head up to the starting line and wait for our time wave to start. I was impressed with how much music they were playing while starting every time group. And here we go! I wish I could of taken some pics but I use my phone as my ipod as well so I was not able to get pics on the course. Over all though I was impressed, the course was good, spread out which is always nice! Me and Do started out together and somewhere after the first mile we lost each other. The crowd was a good turnout and the course was nice, we got to go through GSU which was cool. Only a few hills on the 5k. So for the course I would rate it a 9. The after race was good too! 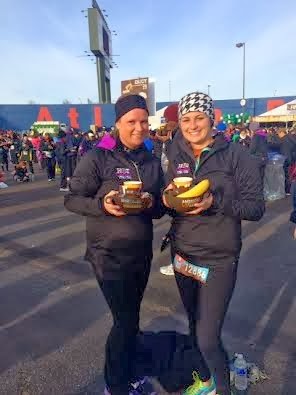 My only complaint about the race would be no actual food after the race. Give me a muffin at least! Come on peeps! 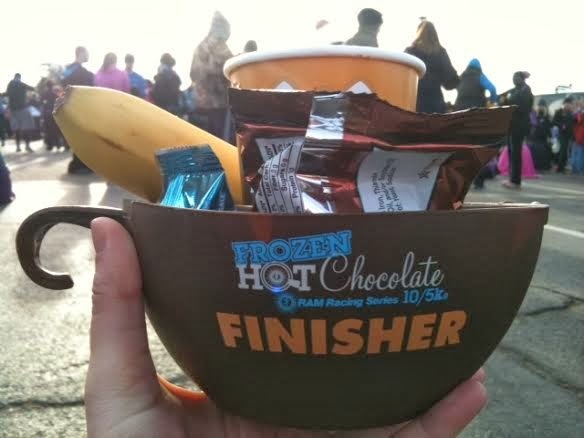 I need more then chocolate after a race! Over all I thought it was a great race! Very organized, fun, and a simple race! I would recommend this race to anyone!